Home › Energy-Efficient LED Lighting › Led Strip Light Mg Kool Tech Bias Lighting Rgb 19.7Inch Flat Screen Tv Cuttab.. Led Strip Light Mg Kool Tech Bias Lighting Rgb 19.7Inch Flat Screen Tv Cuttab..
Super bright SMD5050 (a better model than 3528) RGB color changeable LED, flash, night....high intensity and reliability. With USB Cable (included). 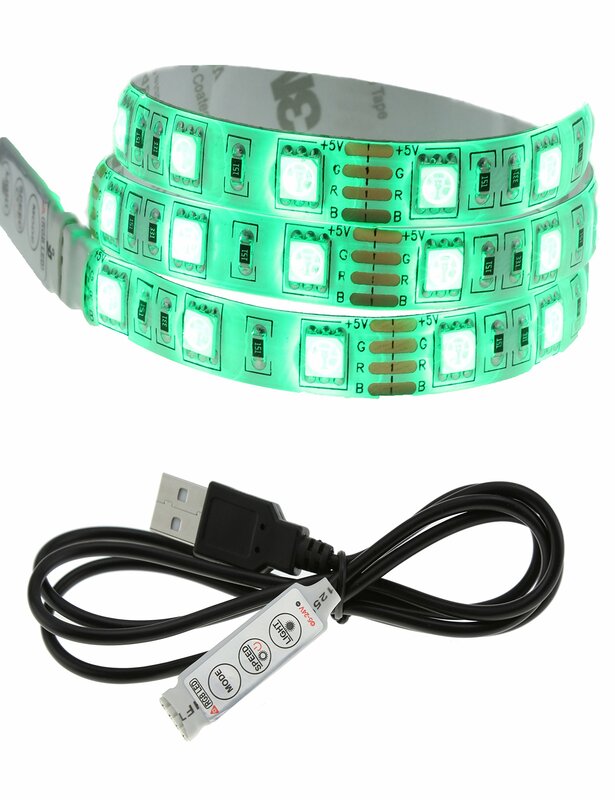 Waterproof(IP65) flexible LED strip. Perfect lighting & decoration solution as flat screen TV backlight, under the counter or cabinet, mood light inside your car, night light in the nursery room, convenient lighting inside the camping tent etc. 1 year free warranty from MG Kool Tech. Color: 50CM Specifications: Length: 50cm Color: RGB LED: SMD5050 Mini Controller: 3 buttons( mode, brightness/speed, color) can change colorsand dim the lights or change speed of flashing LED Quantity: 60/meter Material: silicone Input Voltage: DC5V Wattage: 14.4W/M Electric Current: 2.88A Operation temperature: -20-50 Life time: 50,000hours Waterproof Rating: IP65 Installation Instructions: 1.Clean the surface you intend to stick the light strip to and make sure it'sdustless and dry 2.Peel off the backing strip off the 3M adhesive tape 3.Press and hold the light strip firmly against the surface 4.Plug the USB end into any USB port such as computer, power bank, laptop, carcigarette charger etc.